For those that called it a day for trading a 3PM (eastern), most likely came back to their computers wondering what on earth happened the last 45 minutes of trading to make what was another 3% down day to just under .1% at close. So what on earth happened to make investors think that it was time to start buying? I find it no coincidence that the movement was made near the 820 S&P, as a closing under 820 would have been a pretty strong technical move. Here's some information that hit the press just in time. 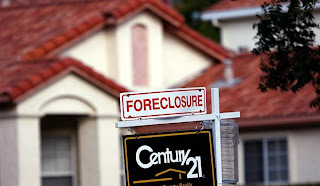 With an hour left before close, the media announced Obama's plan to subsidize mortgages to prevent foreclosures. Once again before any sort of detailed information or laid out plan for the process of doing so, investors immediately jumped on the "rumor" train to gobble up any stocks in sight. It was early in this announcement that caused me to shave off some of my SRS profits from earlier (hit $70 today, I sold some at $68) and went in and bought some FAS. Just in the time before close my FAS went up 3%. This was a complete 180 degrees to what I felt I was going to be doing at the end of the day, but this is exactly why I choose the end of the day to make a lot of my moves. So, yes I indeed joined the buy craze in case this "rumor" train goes into tomorrow. Plus, I got some solid gains from SRS anyway today. So where do I begin in expressing my thoughts of this new plan. This idea is even more out there than Geithner's plan. Subsidize mortgages? Are you kidding me? Is the government aware of just how much toxic debt is outstanding and is going to be outstanding in the next 3 years? Then what happens when commercial real estate hits the fan, which it will. He talks of securing the assets to try and incentivize banks to keep lending. Again, where is this money coming from? If Obama does indeed decide to pursue this outrageous task, it is inevitable that our dollar will be completely destroyed. So I am curious to see how quickly this plan is shot down by the public, but it all came out so quick today, that investors thought of nothing else to do but to buy. So I believe with the combination of the long weekend, it being Friday tomorrow, and our new "rumored" plan from Obama, it would be good to get me some long positions to try and earn some green tomorrow. But I was pretty surprised to see how quickly my Zecco.com account changed. If not for the late announcement, I was actually almost ready to pull the trigger on some more shorts. Like I've said before, you never know what's going to happen during the day, especially with this new administration. I had a feeling they had something up their sleeve, as a big selling day for today would have been a bad sign for the markets. Everyone was surprised to see the market down so much with the, what many thought were "positive, numbers" for retail. A .9% increase reported compared to the -.6% that was expected. However, there was some very bad employment data that came out to quickly kill the optimism. Plus, remember the retail sales is a measure of the total receipts of retail stores, this is not the bottom line. I am more interested in the bottom line of retailers, which can't look pretty. Think of all the liquidation sales that are going on this month and that were left over from the holidays. Everything is on sale. So, indeed, total sales may be up, but I bet you the bottom line or net income is looking pretty scary. So indeed, I switched it up a bit today and it will be interesting to see what tomorrow brings. I definitely will try to get out of FAS as soon as I can as I see no backbone for financials at the current time. If there is indeed a rally tomorrow, I don't expect it to last long. Who knows, maybe the reality of nonsense of the plan will catch up to the market by tomorrow and there will be no rally, which is why I'm setting a 5% stop loss. I do, however, see nothing for green for gold as continual printing of US dollars should keep gold firing. Check out GDX's market trend chart, a +100, wow (get your own symbol analyzed for free, all you need is a name and email, Click Here). See you on the chat, Happy Trading and we'll see you tomorrow. Sign up for the $200 promotion for lending club, click here. FF, what do you use for chat? How can I reach you? Today was a great example of a Plunge Protection Team (PPT) trading day. This article will explain who they are, how they operate, and how you can profit. The real question is: "Why on earth did the market plunge yesterday with much better than expected retail sales? ", I saw a Deja Vu story on GDP numbers which was also better than expected and the market plunged. These plunges were all on low volume and indeed the reaction of panic traders. All the plunges I have been watching for the past 4 months were "very short lived", while at least the rallies extended to a few days or sometimes weeks. The rallies at DOW below 8000 were are on high volume. Whatever you want to call it PPT or something else, it is the reality. The market has bottomed in 2008. Nervous investor selling gives the chance to wise investors to pick up bargains. I think for the past 4 months at least this statement hold more true: "The plunges have been very short lived". I would take this info very serious when investing. This market is no longer trading on fundamentals. It's truly driven by market makers, computer algorithms, pump and dump by hedge fund managers. Also the buy on rumor sell on news, so in the end looking at technicals would be much more profitable. Fundamentals only matters when it's in your face, such as earning seasons where people have no choice but to sell when earnings are just bleeding red. The chat widget is just on the right side of the site, towards the top. Several are on (I try to get on the most I can) throughout the day and discuss movements and trends. Check it out, you don't need to join, just type away. when you have the Friday analysis? The housing market will stay in the blues. The customer service representative called, was apologetic and got straight to the point: they wanted to help me fix my bag. She said she would help me set up a time to pop into the boutique and have it taken care of.